The Atomic 700W Generator by Primus, is a campers dream come true. 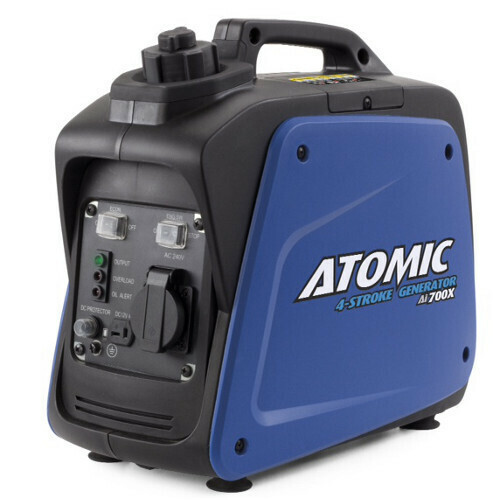 This Atomic generator is lightweight, compact and powerful and all for an impressive RRP of just $399. The Atomic Generator, is a digital sine wave generator with a rated output of 700W and the ability to surge to 800W. This is more than enough to cater to the needs of a camper, giving you the ability to charge batteries, run fridges, small microwaves, laptops, digital cameras and computers. The advantages of having a generator when camping are obvious, it provides you with reliable constant power. You do not need to follow the sun, or catch the wind. Running the generator for a few hours in the afternoon charging your battery will mean your batteries are fully charged, and able to last you for another few days. Often, many campers have tended to go towards solar - because generators have been heavy, noisy and expensive. The Atomic, is not heavy, noisy or expensive. It weights only 8.5kg dry, it's rated at 58dB at 7metres, the equivalent of a quiet conversation. With an RRP of just $299, this one will not break the bank! To buy your Atomic 700W Digital Generator by Primus click here!